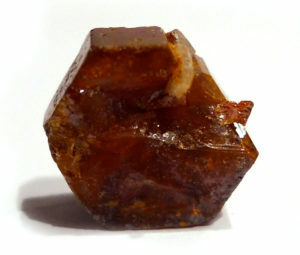 Properties: Vanadinite crystals often form with a hollow centre, and are used in some forms of crystal healing as a vessel, or to contain and limit something (such as cancer). It aligns mainly with the Sacral or Navel Chakra, but energises all the lower Chakras. In spite of its alignment, it can be very cooling, and can be used to reduce inflamation and fevers. It also engenders a feeling of peace and inner stillness, or of being in a womb-like cave. It can also be remarkably light and “floaty”, and therefore is an aid in meditation, journeying and astral travel. In Vanadinite clusters this effect is more intense and light. As this is a lead ore and contains vanadium, use a secondary method to prepare a gem essence and wash your hands after handling.